Success Stories — Redemption Rescues, Inc.
Below are some of the amazing friends who have found their rescue connections over the years. Each and every one of their stories is special and we are so happy that they have found their 'fur'ever homes! Dana, the first of our backyard breeder pups has found her happily ever after and we are thrilled. Here she is with her dad and one of her human brothers. We met Brian and his amazing family thanks to one of RR’s dear friends Meggie. In addition to adopting Sugar from us she and her family also fostered the trio and played an intricate part in their rescue. Dana splits her time between the family’s country house and city apartment and is loving every minute of her new life. Gone are the days of suffering day in and day out in a filthy backyard in Far Rockaway. With our whole hearts we thank everyone who made this rescue a reality, especially her super special guardian angel. Speckles and her siblings were born to feed his need for greed. Who are we referring to? Why none other than Terrence (Trini) Alexis who is awaiting his next day in court on 12/5. The charges in criminal case CR-026514-18QN against him include 1 count of torturing and injuring animals (misdemeanor) and 5 counts regarding inappropriate shelter for dogs. Despite our best efforts, which many of you are aware of, nothing further has been to our knowledge by authorities remove the remaining 12 plus dogs. Speckles may never know how lucky she was to get out of that filthy backyard in Far Rockaway, but we certainly do. She now lives a life where she wants for nothing and every day brings new blessings. We are so thankful to her foster family turned forever family for making all her dreams come true. Here she is with Sugar who is also an RR alum and who she now spends much of her time with. You see Speckles and Sugar’s moms are sisters. And just when you thought things couldn’t get better Dana, who is Speckles sister was adopted by their Uncle and his family. And Scotty was adopted by a friend. Miraculously, the three siblings who started their life amongst abuse, filth and despair all made it out and will forever be part of each other’s lives. Thank you to everyone who made this rescue a reality and please continue to pray for the others that we will never stop trying to help. Teamwork saves another life! Together with our friends at Sarama Animal Rescue we are thrilled to announce Lucky, who is just as his name suggests, lucky, has been adopted. Our stunning boy Is enjoying every second of his life with his new forever dad, who happens to be a friend of his foster hero. “Sounds good to me” is the response heard one day not too long ago at Philly ACCT as his heartlessformer owner was told that the shelter was full and he was marked for death that night. But Lady Luck was on his side and her name was Laura, our good friend and NJ trainer from Sarama Rescue. She had watched him be brought in and overheard everything. Within minutes we saw his picture and we knew we had to help him. We pooled our resources together and we gave him his happily ever after. “Difficult Roads often lead to beautiful destinations” And no one knows this more than our Jada. Usually our adoption announcement photos feature our doggie with their forever humans but in this case we are sharing a picture of Jada with both her forever parents Diane and Brendan, and her trainers extraordinaire Tuncay and Kim of Canine Counsel Dog Training. Truth be told, T and Kim should be in many of the adoption photos we post because they are responsible for so many of our dogs going on to live successful lives. Jada's story is one of survival and inspiration. She was seized after being cruelly used and abused by her former owner Dwayne Banks of Elmira, NY. Mr. Banks, who called her Crazy Red, used her as his personal ATM. She was an over bred bait dog who suffered cruelty unfathomable to most. Ultimately she was seized from Mr. Banks and while the cruelty charges were dropped he was indicted on federal drug trafficking charges. To add insult to injury Jada then languished in a shelter for 8 months. She had already been scheduled to be quietly killed for space when we heard her story and rescued her at the eleventh hour. Her story was almost never told, her life almost never lived. Without further ado, we would like to announce Marshmallow has been adopted! And if this wasn’t enough reason to celebrate, it gets better. 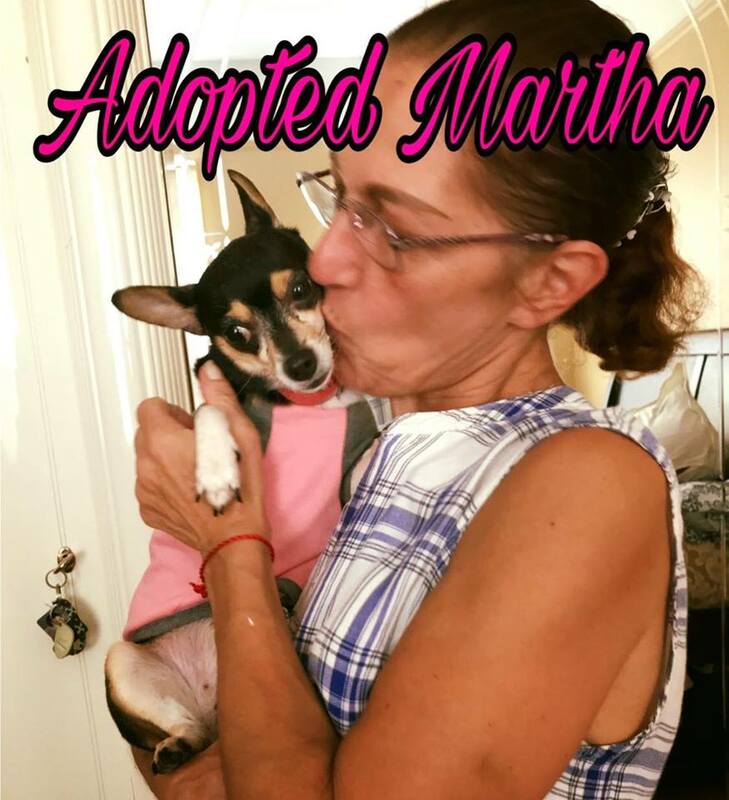 Marshmallow’s new mom is the mom of one of our amazing adopters who gave Sinatra, our cleft palate rescue, his happily ever after. Just look at these pictures and it is clear Marshmallow, now known as Maggie is home. Our tiny little 30 pound nugget has settled right into her forever home where she wants for nothing and is showered with love and attention, which is a far cry from how she was treated in her former life. Miss Marshmallow was an emergency rescue from ACC where she had to undergo pyometric surgery after being dumped immediately after she gave birth when something went terribly wrong... It was reported that she ate one of her puppies (thought to be deceased) and she was rapidly declining. She was owner surrendered, WITHOUT her newborns puppies. We had just finalized the adoption of one of our most tragic throw away mom cases when we saw her and knew we were meant to save her. No sooner had we carried her out of ACC to safety did we realize just how mistreated this precious pup must have been. In addition to the clearly neglectful circumstances surrounding her surrender, she had multiple abrasions and injuries to her tiny body that had been festering for some time. Marshmallow was literally petrified of the outside world, initially frozen with fear, unable to move. This coupled with the fact that she was wee wee pad trained led us to believe she hadn't spent much time outside before meeting us. Slowly our little girl realized she was safe and in no time her her beautiful yet comical personality began to show. She is adored and celebrated by everyone who has the pleasure of meeting her. Look who has found their happily ever after. It's none other than 9 year old teacup poodle Peanut, who we rescued two weeks ago in Rockaway. This little old man's former owners surrendered him to us because they were moving and had no time for him anymore. Funny how there’s no time or room when moving after 9 years of love and loyalty for a wee 5 pound sweet little soul. We welcomed Peanut intoour Nucky's Neverland Fospice Program which blends "foster" and "hospice" together. The selfless fospice heroes who take in these dogs provide love and comfort for them for the rest of their days. We take care of all medical and care costs and they take care of showing them what it's like to be truly loved. Peanut certainly won the lottery when Judy, who is also fospicing our Hope, who we rescued from ACC and who has lymphoma decided to open up her heart and home to our boy. Peanut has recovered now from two raging ear infections, urgent dental surgery to remove 5 rotting teeth and a neuter. He is happy, healthy and loved and will never suffer again. We are ecstatic to announce Rosie has been officially adopted by her foster family. Last August we received a desperate call to help this little girl who had been discarded like trash in a known dumping ground in Far Rockaway. In fact, Rosie was dumped in the exact same spot that Holly, one of our recent rescued throw away moms had been dumped in. Thanks to our friends at Foster Dogs, Inc. Rockaway Rosie turned into Riverside Rosie. Her foster parents fell head over heels for our girl very quickly but because Rosie could sometimes be reactive to other dogs it required a lot of hard work and dedication on their part to acclimate and socialize her. Time and again her now forever parents Liz and Will proved their love was unconditional when it came to Rosie. And ultimately, they decided they just couldn't live without her in their lives. The couple went so far as to cancel their summer plans to leave the city so they could stick around and continue to work with our trainer extraordinaire T of Canine Counsel Dog Training . If this isn't total commitment then we here at Redemption Rescues don't know what is. Life is a series of thousands of tiny miracles that allow for moments like this to happen. They are not lost on us and we are so incredibly grateful. Thank you to everyone who helped us save Rosie's life and get her to where she is today. We love you Rosie and we are honored to have been part of your journey. Muppet.... our sweetest honorary pitbull has been ADOPTED! We rescued Muppet when she was dumped in Far Rockaway with hair so overgrown and matted she was barely recognizable, and cherry eye that needed surgical intervention. We could not say no to this little angel, so an RR honorary pitbull she became. When it came time for family number one to make it official, they actually decided to haggle with me over the adoption fee! So with that, I gladly took our dog back and put her with the family that was meant to be hers all along, with Mom Kathy and sister Tess. I can’t even begin to describe how perfect Muppet, now known as Grace, life is now. She has a doting mom and a best friend sister and we honestly couldn’t have picked a better home. Bruno, our Brazilian bulldog from Broad Channel who we rescued just in the nick of time before being sold online into a life of misery has found his happily ever after. Here Bruno is with his loving parents Dave and Tara and his fur sister Lola. The family has been longtime friends of RR and being retired law enforcement they have plenty of time for hiking, camping and fun with their newest family member. 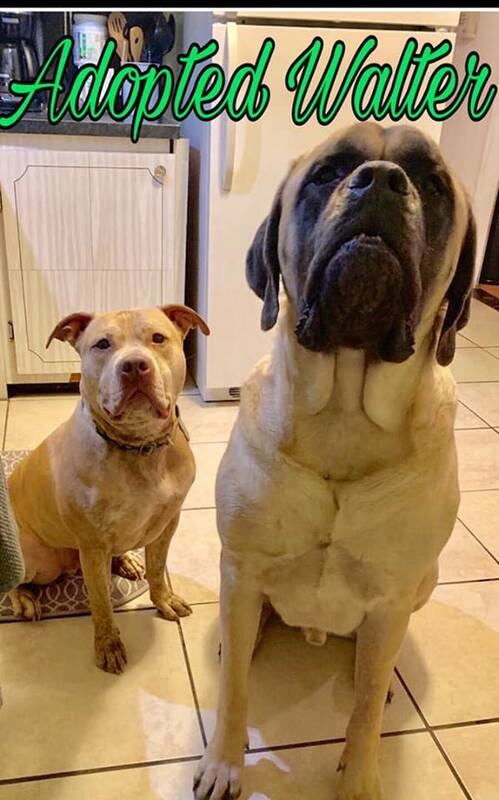 We are so thankful to this amazing family, everyone who shared Bruno’s story, and to his former owner who put Bruno’s safety and well being above making money by selling him to the highest bidder. 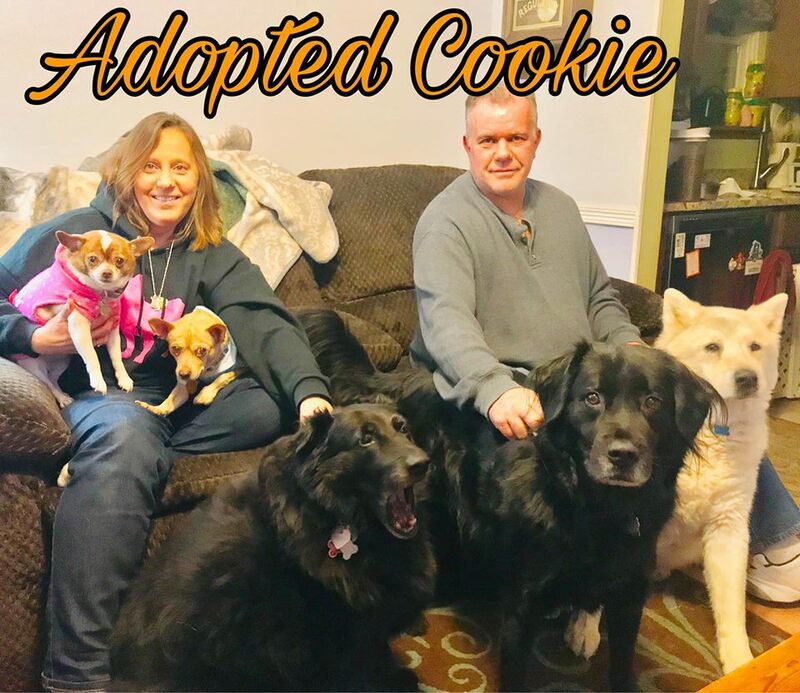 We are ecstatic to announce Cookie has been adopted. It was just 3 months ago that this precious 11 year old girl found herself dumped at ACC. Everything was stacked against her making it out of there alive. Cookie was not only a senior dog but she also has a deformity on her front left paw. When her former owner dumped her at ACC they admitted Cookie had been hit by a car years ago and had never been brought to a vet. This caused her paw to heal deformed. Initially, ACC thought her front leg might have to be amputated. However, once we pulled her to safety and had her thoroughly examined by our trusted vet it became clear she didn’t need surgery at all, Cookie had learned how to compensate for her injury. All that was needed was a little bootie to cover it when she went outside. Cookie is an incredibly special soul, there is something magnetic about her that draws you to her and within minutes you are in love. 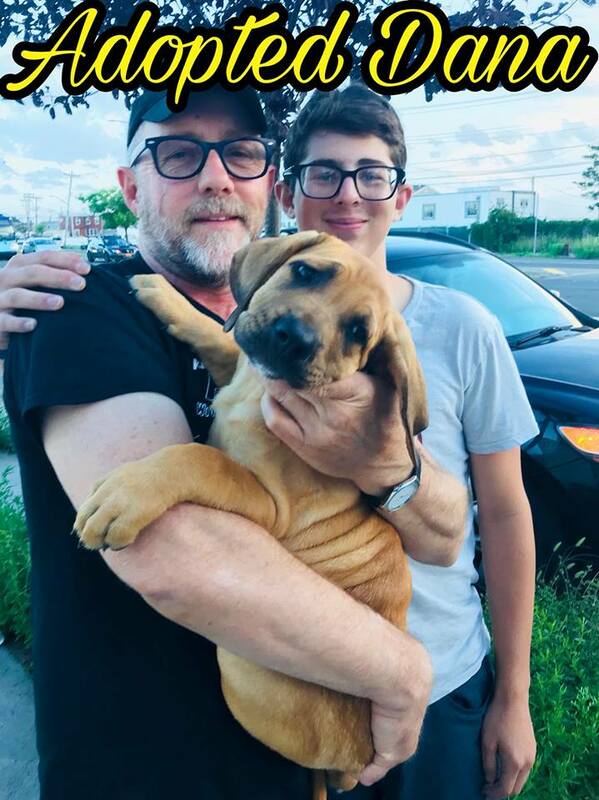 Everyone at Animal Hospital of the Rockaways, her first foster mom Kathleen, and clearly her foster failing, now forever mom and dad, Michele and Chris all have experienced this. Here is Cookie, in one of the best family photos ever taken. As you can see her mom and dad have a huge heart for rescues, especially senior ones. They are champions for both animals and humans on Long Island. They have fostered dogs for people who have gone on extended deployments to serve our country, they help local rescues whenever and however they can, they even do their own rescues. Cookie’s sister Yoda, the chihuahua, was only rescued because Michele and Chris were able to catch her in traffic after she was dumped on a scorching hot day in summer. Michele was running around in traffic while Chris was corralling the scared baby on his motorcycle. Clearly Cookie couldn’t be in a more perfect home. Thank you to everyone who made this rescue possible. We love you Cookie.